Rate coding is a characterization of the relationship between stimuli and neural reponse! This lab will introduce you to the basics of measuring and interpreting the neural response to external stimuli. You should have used the SpikerBox beforehand. After this lesson plan, you should be ready to move onto some more intermediate SpikerBox experiments. CCSS.ELA-Literacy.RST.9-10.6 Analyze the author's purpose in providing an explanation, describing a procedure, or discussing an experiment in a text, defining the question the author seeks to address. CCSS.ELA-Literacy.RST.11-12.5 Analyze how the text structures information or ideas into categories or hierarchies, demonstrating understanding of the information or ideas. CCSS.ELA-Literacy.RST.11-12.6 Analyze the author's purpose in providing an explanation, describing a procedure, or discussing an experiment in a text, identifying important issues that remain unresolved. 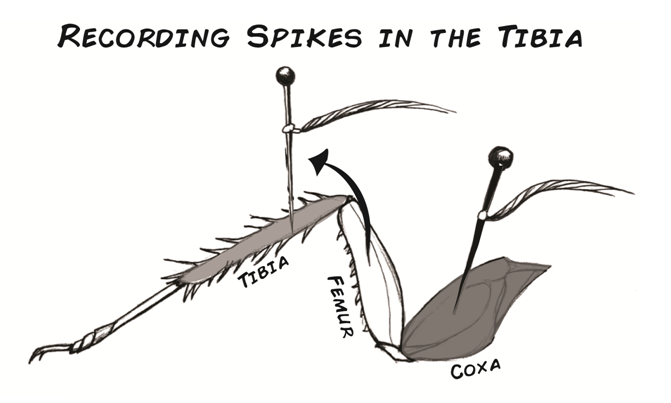 In this exercise, you will use several methods to record data from your cockroach leg, and how to measure the spikes caused by different stimuli. Now that you have successfully witnessed spikes, you are ready to record, quantify, and graphically present electrophysiology data. The method you will use to compare differences in spiking from different stimuli is called rate coding and it is one of the most reliable tools in neuroscience. Rate coding is simply measuring the number of spikes that occur during a set period of time. However, even though it is simple, rate coding can be used to answer complex questions about how neurons respond to stimuli. You'll need a cockroach leg set prepared in the same way as the first lab, Getting Started With the SpikerBox. You will place one electrode in the coxa and one in the femur (see diagram below). Plug the audio adapter cable into the SpikerBox and your computer. Note: for the SpikerBox to record properly, your computer's audio input jack must be audio only, not a combined audio In/Out jack. To make sure everything is working properly, listen to the sounds coming from the SpikerBox speaker. Turn on Audacity, open a New window, and ensure the setup described in the previous exercise has been completed. To record from your SpikerBox, simply click the Red Circle at the top of the screen. You can stop recording at any time by pressing the Yellow Square. If you begin to record again, the new "Track" will appear below the previous recordings. You can rename each track by selecting the Audio Track button next to your waveform. If you want to delete a track, select the X button in the upper left of each track. Turn off your cell phone and Wi-Fi. Signal interference from these devices is significant. Ask your teacher permission to send a classmate a text. What does this tell you about how cell phones work? During each experiment, it is wise to record without stopping. Noise created from cell-phones, moving the electrodes, or a variety of other sources can be removed prior to analysis. However, turning your recording on and off may become confusing. The easiest way to keep track of what your data corresponds to is to keep good notes in the space provided. When you save, Audacity will save your "Project" in two forms that may be confusing. The first file saved is a folder ending in "_data" and the second is a file ending in ".aup" The .aup file must be in the folder holding the _data folder. In other words, keep the .aup file in the parent directory of the _data folder. You can now begin experimenting with your cockroach leg! With your cockroach leg, you will compare how neurons in the leg communicate with no stimulation, a light touch from a toothpick, and a strong blow of air through a straw. A variety of answers would work, here but students should be able to distinguish between the "shallow" or "light" sensation of the paper, and the "deeper" or "solid" sensation of the finger poke. There are several reasons for why you differentiate the two stimuli. First, the light touch likely stimulates nerves from a very small area while the more forceful poke may stimulate neurons from much more of your arm. Second, the light touch may only stimulate neurons that respond to being compressed. One type of neurons called Merkel cells, send action potentials to the spinal cord and brain in response to light touch. These cells fire faster when stimulated. Therefore a light touch increases their firing rate, which in kind is interpreted by your spinal cord and brain as a light touch. Additionally, there may be other neurons stimulated for fire faster that convey another sensation such as pain. If your schedule doesn't allow you to do the full rate coding activity, you can use a shortened version of the activity, which uses only a few types of stimuli and only measures the response to stimulation in the femur. To use the shortened version, follow the directions up to step 5 and then use the given table to record your results! Ensure your setup is functional by poking the leg a few times. If you see no response, you may need to adjust your electrodes or select another leg. Record the spontaneous spiking patterns from the leg for 5 minutes. Note the begining and end time of your control recordings in Table 1. Take a toothpick and stimulate the barbs on the tibia of the leg. Try several variations of stimulation including constant pressure or repetitive poking, until you find one that gives you consistent reactions. Write your stimulation method in Table 1. Follow the directions in section 4: The Basic Analysis of Spikes to quantify the differences between your treatments. Now you will do a controlled experiment to see how different strengths of stimulation affect the cockroach leg. You will use the compressed air on your lab bench to stimulate the cockroach leg for this experiment. Teacher Note: No Compressed Air in your classroom? No Problem! Use a drinking straw and have students blow on the cockroach leg from different heights. You can tape straws at different heights to a ruler, to standardize the heights. Be sure to remind students to blow consistently during each trial. You can purchase compressed air in an aerosol canister at an office supply store. Compressed air is often sold in the computer section because it is used to clean keyboards and computer components. As with the drinking straw method, you can have the students hold the compressed air canister at different heights to achieve different strengths of stimulation. Be sure to modify the student worksheets to reflect your new experimental design! First observe the spikes that occur without any stimulation. Record the start time and stop time of your observation and write down any notes that you observe. Give the cockroach leg at least a 30 second break. Next, stimulate the leg by turning on the compressed air at the lowest pressure (5 psi). Use the hose to direct the compressed air at the cockroach leg. Record the start and stop time and any other notes you might observe. Now raise the air pressure to the other psi levels listed in the table. As always, note the start and stop time for each observation in the table below. To better analyze your recordings, you will want to isolate them into sections. Use the following method to isolate sections of your recordings. You will begin with the 5 psi trial, and then repeat the procedure the other air pressures that you used. Using the recordings from your trial at 5 psi, find a representative section of spikes between 5-10 seconds long and select it with your cursor. Press the left click and drag across the waveform to select. Select a region with clear spikes and as little noise as possible. Copy the selection (Control-C), open a new Audacity window (Control-N), and paste the selected 5-10 second waveform (Control-V). In the Effect drop down menu, select Amplify. A dialogue box will appear which asks you to select the amount of amplification. The default selection is the amplification that keeps the audio from reaching beyond 1.0 or -1.0 on the scale. Record the Amount of Amplification value from the dialogue box in Table 1. Use the default settings and click OK.
One of the first things you may see is that spikes do not always occur in a regular fashion. You may also notice that not all spikes look the same. As shown in Figure 9, spikes may have 2, 3, or even 4 peaks to them. 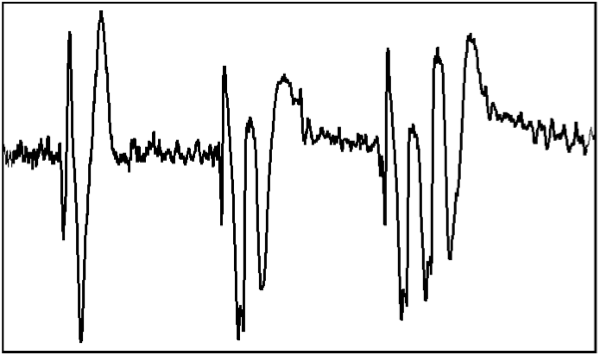 These are not special action potentials, but groups of action potentials. In this next step you will quantify the relative frequency and size of action potentials produced by a cockroach leg in response to your stimulations. You will be categorizing the spike peaks by amplitude in a process called binning, or separating spikes into categories (bins) based on size. Figure 10 provides a screen shot of Audacity that will help you in this process. The bins will be the scale used by Audacity (Yellow Arrow). Keep in mind that you are measuring negative peaks as well as positive. Isolate and amplify a 5 second section of recording from the No-Stimulation condition, using the above method. Be sure you have recorded the Amount of Amplification in Table 2. Widen your Audacity window to fill the width of your screen using the Window Resize tool (Red Arrow). Use the Zoom In tool (Fig. 10A; Purple Arrow) so that you can visualize a small section of your trace, and easily identify the peaks of your spikes. At this point it is easy to eyeball the difference between peaks like those circled in Green and Red. However, for the purposes of quantification, you want to have a consistent methodology that will allow you to reproducibly determine if the peak circled in Blue is different than that in Red. Look over your data briefly and decide on a threshold for what is noise and what you will accept as data. One way to do this is to look at your control recording (no-stimulation) and identify the largest spike during the recording. You can take the height of this spike as your cut-off. What was the height(or depth) of the largest spike in the "no stimulation" condition? 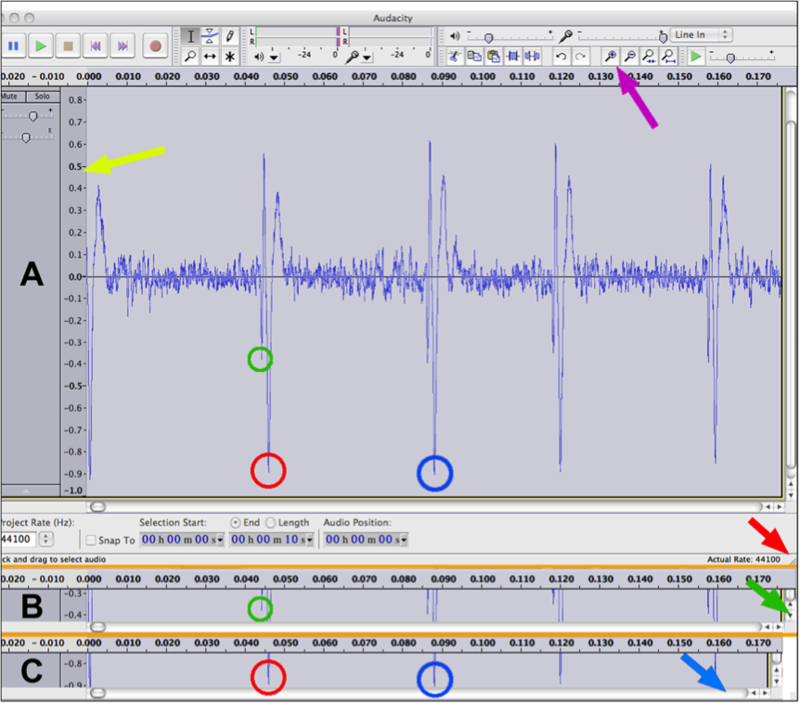 Using the Window Resize tool (Red Arrow), shrink the Audacity window vertically, so that the scale on the left of the screen shows only 0.1 of the total height of the waveform (Fig. 10B). This will allow you more accurately determine whether the spikes you observe are under or over the threshold. Select from 0.0 - 0.1 seconds of your 5psi recording to collect data. Count the number of peaks that exceed the threshold you determined in question 5. Record these in the table below. Find the section of recording for the other treatments, and repeat steps 7 and 8 for your trials at 5 psi, 15 psi, 25 psi, and 35 psi. 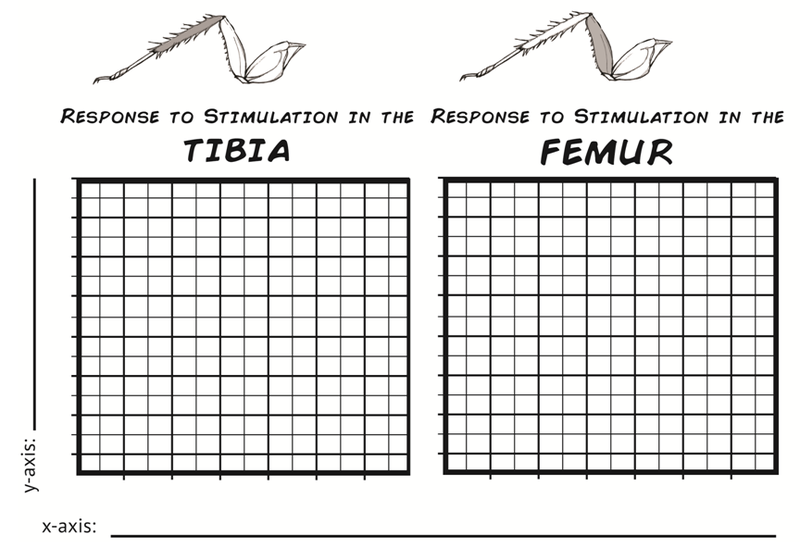 Now construct two graphs that compare the spiking rate in the tibia and the femur at different levels of stimulation. Think carefully about what the x and y axes will be. At the beginning of the rate coding exercise you chose a threshold for which spikes you would count. How, if at all do you think that your results would differ if you had used a higher threshold? A lower threshold? If you chose a higher threshold, fewer spikes will exceed the threshold, and therefore the counts for every treatment will be lower. Choosing a lower threshold would mean more spikes would exceed the threshold, and therefore counts would be higher. Choose too high a threshold, and you will have no data, choose too low a threshold, and every spike will exceed it and you will have nothing but noise. How did the neuron firing change as you stimulated the femur with increased air pressure? How did neuron firing change when you stimulated the tibia with increased air pressure? Describe your findings in the paragraph below? For both treatments, the spike rate increased with greater stimulation. However, the spike rate increased more when the tibia was stimulated, than the femur. Neurons in the tibia respond more strongly to stimulation. Did neuron firing change when you applied the same stimulus continuously? If it did, why might this be the case? Neurons fired rapidly when a stimulus began. However, when the stimulus was applied over time they did began to respond less to it. This is because the neurons become accustomed to the stimulus and then reduced their firing rate, a phenomena know as neural adaptation or sensory adaptation. Neuron spikes are all the same size, and scientists have demonstrated that amplitude of a spike does not change with the strength of the stimuli. Yet in some treatments you may have observed some spikes that were smaller than the others. How might the set up of the Spikerbox cause some spikes to appear smaller (hint: think about distance between a neuron firing and the recording electrode). Why would this occur more in some treatments than others? 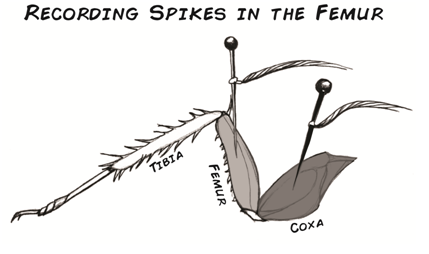 Spikes might appear smaller if the neuron firing was far away from the recording electrode. In low-stimulus treatments, fewer neurons fired over all. Therefore it was more common for far away neurons to fire, and for these spikes to be registered as "smaller" when recorded by the SpikerBox. Why might being able to discriminate different types of stimuli be advantageous to insects? Different strengths of stimuli can indicate different types of environmental changes. For example a predator rapidly approaching might create a strong air current, while a soft breeze would create only a weak air current. Being able to discriminated between these types of air currents would be help insects distinguish between real threats, and background air movement.